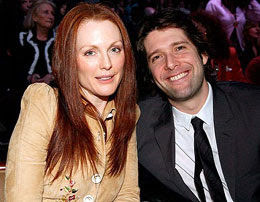 Julianne Moore and Bart Freundlich. Julianne Moore is successful, over 40 and is happily married to a man 9 years her junior. Love Knows No Age Difference. Geena Davis’s husband is 15 years younger. Geena Davis & Reza Jarrahy are married and have three children. She is a member of American Mensa, the society of persons with IQs in the statistical top 2% with an IQ of 140 and she chose a younger man. That should tell you something, that a younger man is a smart choice for an older woman! Joan Collins has always demonstrated class and sexiness in her personal life. She has also been known for her love of younger men. "My husband is 32 years younger than I. So what? It saddens me to think that people consider that a problem. It’s trivial." Percy adds: “I’m not going to be so naïve as to pretend we didn't spend a lot of time discussing that very issue. But it's a damn shame for two people so happy together to make the difference in age the reason for not being together." Many women are dating and having relationships with younger men these days, not just celebrities. According to a recent survey an amazing 34 percent of women over 40 are dating younger men. Joan Collins you are an inspiration! How to get a younger man - Ask and you shall receive! If you have been thinking about dating or having a relationship with a younger man all you really have to do is ask. New research has shown that if a woman asks a man to have coffee, or dinner or a movie with her he will respond with a yes 90% of the time. So if you see a hot younger man in the grocery store, or the bookstore, or the coffee shop, just walk up and ask him if he would like to go for dinner or a drink sometime, and see how quickly he responds. Perhaps it is the male ego, but studies have shown that in this situation a man will hardly ever turn you down, so the odds are in your favor! So if you want a younger man in your life, all you really have to do is ask!